Erin.Lane's 2015 bag club is accepting sign-ups. This year's club is designed with the crafter and her budget in mind. The Under $100 bag club has four options for you to choose from. Get your geek on, show your love for your feline friends, surround yourself with bags with yarn in AND on them, or strut your stuff carrying a Dr. Who bag. Each themed option includes 4 bags sent over the first 3 quarters of 2015. Sign ups close on January 15th. Gigi finished the December Socks. All the #25 Days of Enabling can be found on Pinterest and in the Knitmore Girls forum. Jasmin worked on the Winter Wonderland socks, in the Gynx variation. She is doing the Fork in the Road pattern by Lara Neel. Gigi has finished two preemie hats out of some leftover bit of abandoned knitting. Jasmin has finished a pair of tube socks for Genevieve out of Frozen Throne, and has started a pair for herself. 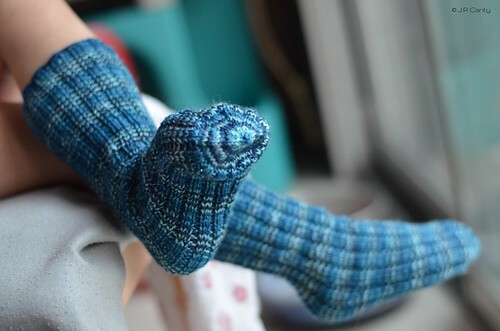 The "Genevieve's tube socks" pattern has been published, and is available for $1. Gigi started two more preemie hats out of leftover yarn, and will do some crocheted finishing. Jasmin is reviving all of our KALs, the #MatchyMatchyKAL , #ProjectSweaterChest, (#FFFWKAL) Fit, Flatter, Feel Wonderful Kal , #OperationSockdrawer, and the SPAKAL. Double dipping is encouraged. Gigi is working on the beaded edging of the Wild Iris and is enjoying it a lot. #KiltMeNowKAL. She is also working on the Mystik Spiral socks. Again. Jasmin mentioned her Philosopher's Wool sweater. (Their website has a date of 2014. They had health issues, I do not know if they are still operating their business). We mention Commuter Knitter and Boston Jen from Down Cellar Studio. - Meet and Greet from 11:30-1pm. We will be collecting preemie hats. Prizes for this contest are two braids of fiber and two skeins of yarn from Gourmet Stash in the colorways "Time Traveler" and "Waterweed". how to deal with extremely long rows of knitting. Jasmin enthuses about Hoxton's review of Merlin. Gigi has ripped out her knitting on the Grinchy/Broken Ornaments socks, because the pattern she was knitting just wasn't talking to her. Jasmin mentions C.C. from the Geeky Girls Videocast. This week we purloin ideas from other podcaster's end of year summaries. The Geeky Girls are doing 52 in 2015, knitting 52 preemie hats in 2015. Gigi has finished two hats already. She also was listening to Die Urbane Spinnstube, hosted by Distelfliege, who has decided to spin at least 15 minutes a day. So Gigi decided to copy this idea, and has been spinning on her Jenkins drop spindle every night. Commuter Jen is very organized and had this amazing idea of how to organize your ravelry queue to be able to search for the years finished projects instantaneously. Gigi put a divider in the back of her shownotes binder to write down projects as they get finished. Low tech. What are your fiber goals this year? Inquiring minds want to know. These are the ladies from Tincanknits, and we really like their designs. Jasmin enthuses about Yokes, by Kate Davies. which we reviewed last week. She also mentions yarns by Lisa Souza, and Bijou Basin Ranch. Jasmin is doing the #IronSwatchChallenge LINK and has been steeking sock swatches on her Featherweight. Jasmin looked on Kate Davies blog for a tutorial on machine sewn (was actually from Knitty.com, again, misattributed) and Crocheted steeks.